Entry is free, but the bruises will cost ya. Never seen roller derby except on TV? Now is your chance to see it – in person, for FREE – in Eau Claire. Come cheer and jeer the Dishonor Roll, Treacherous Teachers, Psychotic Principals, and Low-Down Lunch Ladies at the Back to School Bruise-a-Thon on Saturday, Sept. 7. Watch them block and jam in four bouts, and if you’re brave, you’ll ask to sit trackside in the Suicide Section (for safety reasons, it’s reserved only for adults). And, if you’re really, really brave, female, and an experienced derby skater, you’ll show up at 1:30pm for the skater check-in. The Bruise-a-Thon kicks off the fourth season for the Chippewa Valley Roller Girls, this area’s original all-female flat-track roller derby league, managed and operated entirely by the skaters themselves. By day, these women are stay-at-home moms or work in business, education, graphic arts, or IT, right here in Chippewa Falls, Eau Claire, and Menomonie. You probably run into them at the grocery store or the gas station. But appearances can be deceiving. Have them lace up a pair of skates, and don helmet and pads, a crazy-colored outfit and torn pantyhose, and they become your worst nightmare: Arm & Slam-er, Cut Throat Kitty, Shawton Shank’er, Stunt Double, and Tax Breaker, to name a few. Why do they do it? “This sport is very demanding on your body, but also extremely rewarding when you are soaked in sweat and completely drained with a huge smile on your face,” said CVRG President Kimm – aka Stunt Double – a graphic designer by day. 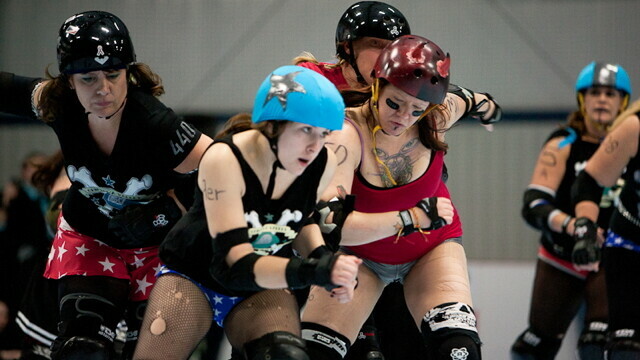 The CVRG is also recruiting “fresh meat” (aka new skaters) of all skill levels, ages 21 and up, on Tuesday, Sept. 10 at 5:30pm at the Eau Claire Indoor Sports Center. That’s your chance to learn about the league, meet skaters, and get your questions answered. Tickets and season passes are available at the door and at Volume One’s Local Store. Single tickets are also available at the Indoor Sports Center, Tailgates, and VFW Post 7232.